Cessation of menses for 6 months, in a female who was previously menstruating. Obs/Gyn history: past endometritis, D&C, significant hemorrhage. These factors may point to a diagnosis of Asherman’s syndrome (scarring of endometrium). βHCG: To rule out pregnancy. TSH, PRL: To test for hypo/hyperthyroidism and hyperprolactinemia. LH, FHS: For practicality’s sake, these would probably be ordered at the same time as TSH, PRL. If levels are high may indicate premature ovarian failure. If levels are very low, that may point to a sellar tumor, so obtain an MRI. If levels are normal, there may be a functional hypothalamic cause for the amenorrhea (e.g., malnutrition). +/- Estradiol: These assays lack sensitivity, standardization, and only capture a single time point. Progestin challenge: To test the patient’s estrogen status. Administer a course of progesterone (~ 7 days). If this results in bleeding, there is evidence the patient is progesterone deficient, anovulatory, or has an androgen excess. If there is a lack of withdrawal bleeding, there are still a few causes to examine, so try the estrogen/progesterone challenge. Estrogen/progesterone challenge: Give a course of estrogen/progesterone. If there is withdrawal bleeding, it is apparent the patient has an estrogen deficiency. If there is no bleeding in response to the challenge, the suspicion for an anatomic abnormality is heightened, so visualization of the uterus is indicated (e.g., hysteroscopy). Young women with premature ovarian failure can take hormone replacement to protect against early bone loss, menopause symptoms, and improve sexual health. These benefits may outweigh the associated increase in risk of MI, stroke, or breast cancer. Master-Hunter T, Heiman DL. 2006. 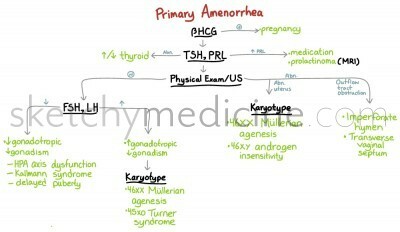 Amenorrhea: evaluation and treatment; 73:1374. The Practice Committee of the American Society for Reproductive Medicine. 2008. Current approach to amenorrhea. Fertility and Sterility;90:S219. Welt CK, Barieri RL. 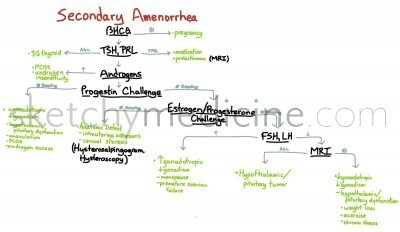 Etiology, diagnosis, and treatment of secondary amenorrhea. In: UpToDate (Eds: Snyder PJ, Crowley Jr WF, Kirkland JL). Accessed 2013.10.05. By age 15/16, with normal secondary sexual characteristics. In contrast, Secondary Amenorrhea refers to a loss of menses after it has already been established. The causes of amenorrea are myriad, with an important one being pregnancy. Family history: Does everyone have relatively late puberty? βHCG: Gotta rule out this common reason first! +/- Androgens (testosterone, DHEAS, 17-alpha-hydroxyprogesterone): May indicate PCOS or androgen-secreting tumor, androhen insensitivity syndrome, or 5-alpha-reductase deficiency. 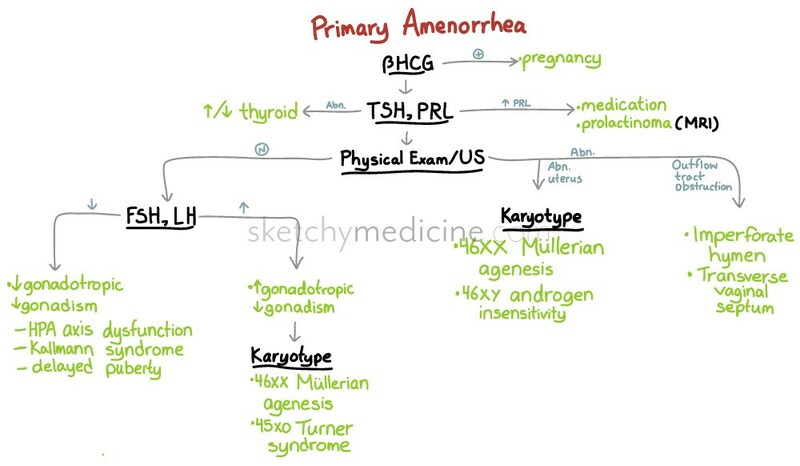 Since chromosomal abnormalities account for half of the pathologic cases of Primary Amenorrhea, karyotyping will be useful for patients who are found to have abnormal uterine anatomy on ultrasound or have elevated FSH, LH. Patients with an absent uterus may be worked-up for abnormal Mullerian development (46XX karyotype and normal female testosterone levels) versus a deficit in masculinization (i.e., androgen insensitivity syndrome, 5-alpha-reductase deficiency). There is a normal uterus, and LH and FSH are high, that means there is nothing feeding back to stop their release; karyotype may reveal Turner syndrome (45XO), while normal karyotype (46XX) may indicate Mullerian agenesis. Reduce risk of complications (e.g., remove undescended tests in androgen insensitive patients to mitigate cancer risk). Welt CK, Barieri RL. 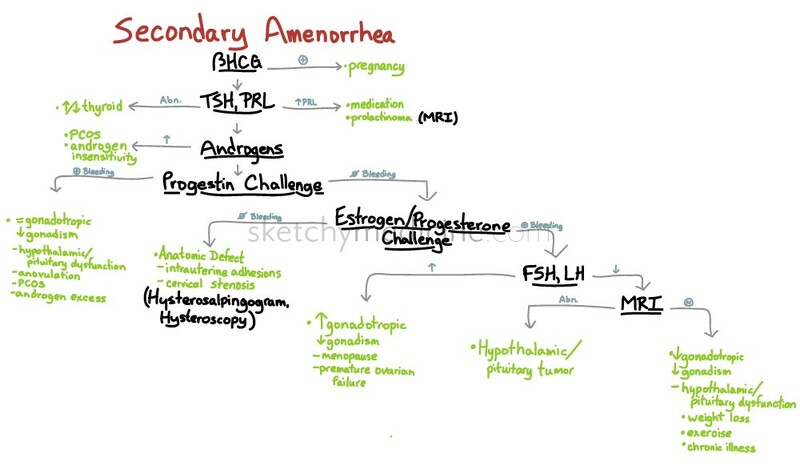 Etiology, diagnosis, and treatment of primary amenorrhea. In: UpToDate (Eds: Snyder PJ, Crowley Jr WF, Kirkland JL). Accessed 2013.05.05. The nice thing is the the pituitary hormones are aptly named so that FSH (follicle stimulating hormone) stimulates the follicle to grow and LH (luteinizing hormone) causes ovulation (the infamous LH surge) and subsequent corpus luteum development. 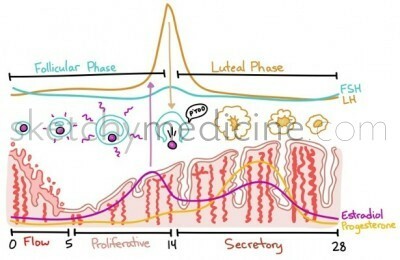 Meanwhile the developing follicle secretes estradiol which stimulates the proliferative phase of the cycle. Then the corpus luteum secretes estradiol and progesterone to kick things into high gear for the secretory phase. You can now passively study this all the time (and keep your own notes) on a notebook or a mug. Nothing says “mmm, coffee” like the hormonal phases of the female reproductive system. As with all of the pituitary axises, the thyroid one is a little confusing when people talk about it but really quite simple when it’s drawn out. 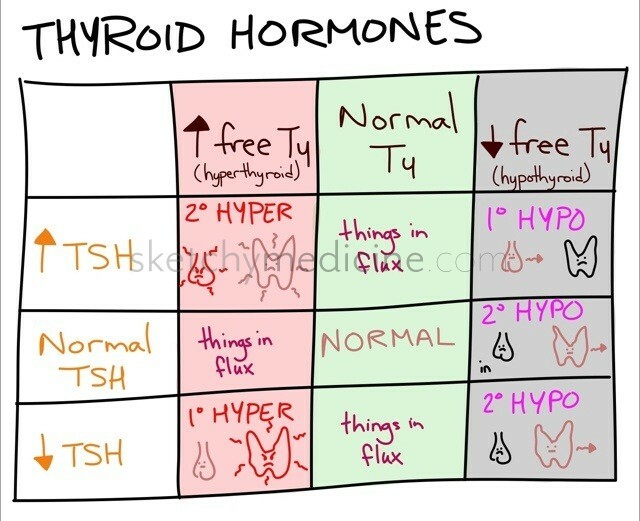 Free T4 is what normally gets measured to determine if someone is hypo- or hyperthyroid, but if you are just doing a basic screening test, you only need to measure TSH. 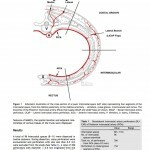 In the image, black represents the gland not functioning, while red is it going wild and crazy. 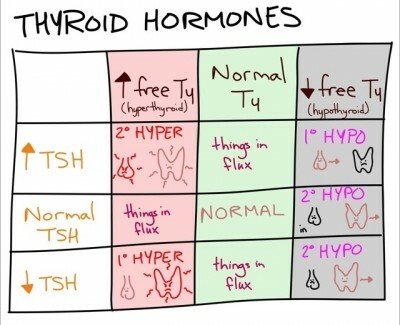 remember that primary is the END ORGAND (in this case the thyroid). Things in flux simply means that you’ve measured someone’s levels while things were in the midst of a change. This is because T3 and T4 levels can change fairly quickly, but it takes a while for the pituitary to catch up. This can happen either in the case of one of the glands ceasing to function or the person has recently started medication to correct thyroid hormone levels and the thyroid has changed but the pituitary hasn’t.